Our Household Energy Transition – Becoming a Fossil Fuel Free Family. You can download this from the ‘Downloads’ or ‘Household’ tabs on the yellow bar at the top of the page. You can also view an embedded version of this book at the ‘Households’ tab. This book describes our journey, so far, to fossil fuel freedom. I always intended this site to simply be a repository of books/reports that I produce from time to time. Over the past four years the scope of my work has broadened: I started out in 2012 producing the first of my three books on the carbon footprint of aviation; I then moved on to electric vehicles; and now I have released my fifth book. While all the books are on related topics, for ease of access I’m placing new material on separate pages. The aviation carbon footprinting material is still the most commonly viewed information on this site and I am therefore giving this the easiest access – you can view some of this material from the ‘Recent Posts’ links to the right or by scrolling down the home page. Alternatively you can use the ‘Aviation’ tab on the yellow bar at the top of all pages on the site. The tab bar also gives access to the ‘Electric Vehicles’ and the ‘Household’ material. All my publications are accessible from the ‘Downloads’ tab. To date the arrangements for downloading my reports and other work have been less than ideal. I have now created a ‘Downloads’ page which can be accessed from the tab in the yellow bar at the top of the page. All the material I have generated and highlighted in my blogs can be downloaded from there. Today I’ve released three new tools which allow the user to generate carbon footprint profiles for global scheduled international passenger flights in 2012. 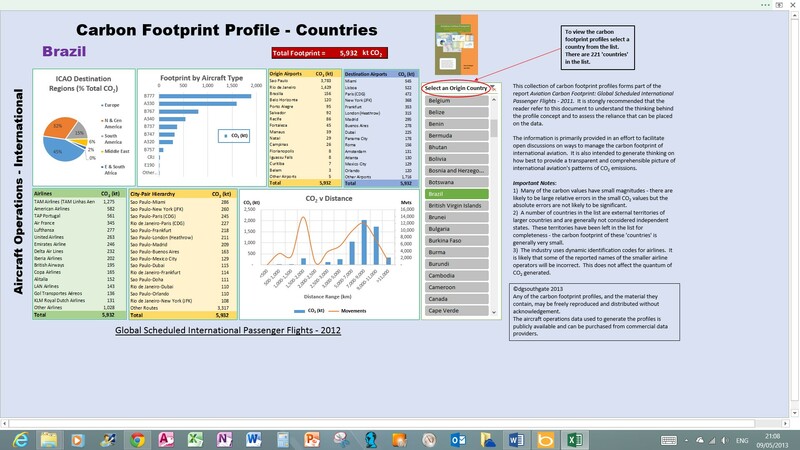 I used this dashboard style concept to summarise carbon footprints throughout my book Aviation Carbon Footprint: Global Scheduled International Passenger Flights – 2012. The tools are simple applications which let the user generate ‘one click’ carbon footprint profiles for all the countries, airports and airlines which were in the database that I used to produce the book (221 countries, 1,274 airports and 492 airlines). These are Microsoft Excel applications and only work with Excel 2010 and Excel 2013. Due to some incompatibilities between these two versions of Excel I have generated separate files for the two different versions. The files for the generators are free and can be downloaded via the ‘Downloads’ tab at the top of the page. 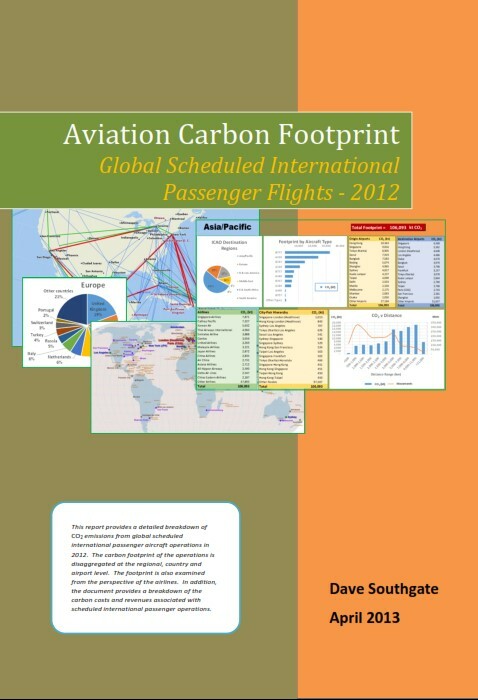 I have just released my second book on aviation carbon footprinting – Aviation Carbon Footprint: Global Scheduled International Passenger Flights 2012. This book follows on from The Carbon Footprint of Aircraft Operations in Australia – 2011 which I released in October 2011. It uses the same computational method and reporting style as the earlier book to extend the Australian carbon footprinting to global international operations. In a similar manner to the first book, this document is designed as a resource for researchers, industry analysts, policy developers and interested members of the public. It is aimed at stimulating thinking on better ways to both manage the carbon footprint of aircraft operations and to monitor and report aviation carbon footprints.